Welcome! I’m not going to give you an introduction to this post…lets jump right in because it’s Friday and we don’t have time to waste…it’s almost the weekend! 10 things I need to make sure are on my website! #1 My Brand- I had been working on revising my brand and look. My brand deep down is still ME!-Erin Rachel Photography. I had felt for awhile though I needed to refine my visual brand and thanks to the help of so many…which I will be blogging about soon…I made it happen! #2 Marketing- I wanted to add the “Pin-it” button to all of my images on my blog…so we added that!! Isn’t everyone on pinterest these days? why not allow them to pin your images? Are you? Lets follow each other. #3 Pro-Photo- Upgrading to Pro Photo 5 was needed. This enabled me to update my entire site with better features for me to display as well as my end on the backside of my blog and website! 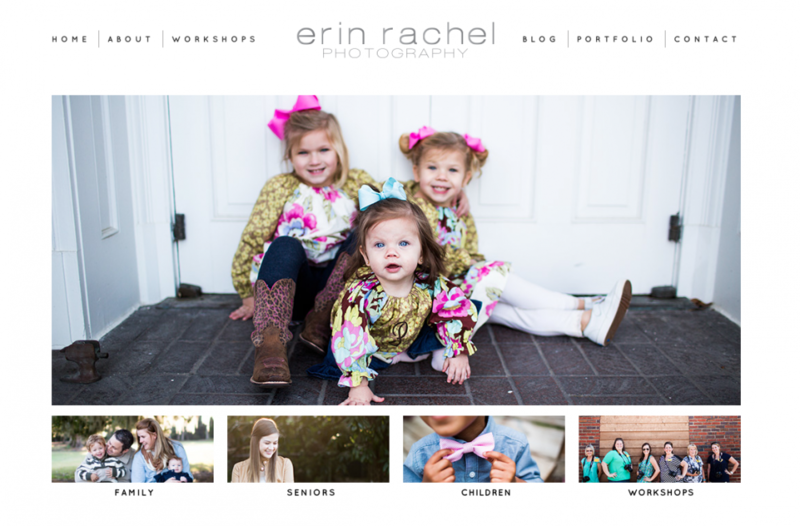 I can’t brag on Pro-Photo enough and how easy they help make my life on the blogging end! Not to mention their customer service is phenomenal! I need that seeing I’m sooooo illiterate on websites and blogs! #4 Social Media- I needed to add my social media buttons. Since my original site had been launched there were quite a few social media buttons that needed to be added. This is simple but vital. Does your site have the social media links readily available for your followers? #6 Workshops– all of the basic photography workshops to teaching photography editing all the way to photography mentoring with your business, I wanted those pages on my site to be easy to navigate and give the information needed to those interested. Boom! I think that happened! #7 Bio– or might you say my about me page desperately needed updating. For crying out loud I’ve been married for 8.5. months and the poor website never knew it!! *smile* well it did but you know what I mean! That’s important information that needs to be posted!!! If you have a business/website- ask yourself if your bio is updated? Do you have a headshot you are pleased with? #8 Newsletter– I have started a newsletter and those interested can now sign up for it right on the blogsite. They simply add their email address and they will be on the list to receive updates and news! #9 SHOP- This one I’m super excited about…now in my workshops when I mention a piece of equipment or a tool to better your craft…it will be easily accessible in my SHOP link, which is a drop down under workshops. I’m still currently added to it, but there are some recommendations I have made…I’ll be adding more…don’t worry! #10 Blog Series– last but not least I have started a new blog series and hopefully will be adding more in the future…but TWO TIP TUESDAY will be happening weekly-giving you tips to better your photography and business (for those in business). Some weeks may only be 2 tips other weeks there will likely be more. As this builds the content will begin to get more in depth. Follow along by the RSS feed on the left of the blog! Then each blog post will be automatically sent to your email inbox!